I just got an email from my friend Steve, who has returned from a vacation visiting his parents who live in a condo in Sarasota, Florida. 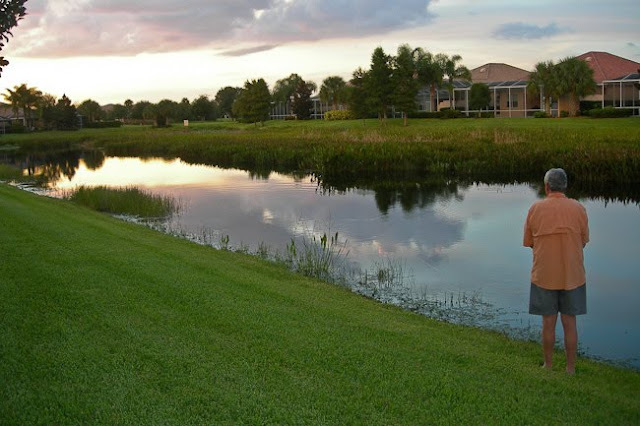 I had heard that lots of the "man-ponds" in the condo developments down there held some pretty big bass, so I was very interested in how Steve would make out when he told me the week prior that he planned to take a fly rod. I've included his email below and some of the pictures he sent me. Note the professional fly fishing outfit *grin*. 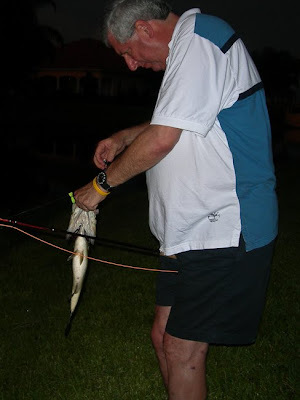 "I took my 8-1/2' 6-weight with me, and bought a few flies down there (Never again! Way too expensive.) I fished three times, and caught 2 bass each time. As you'll see from the photos, it was most productive half an hour before dark. 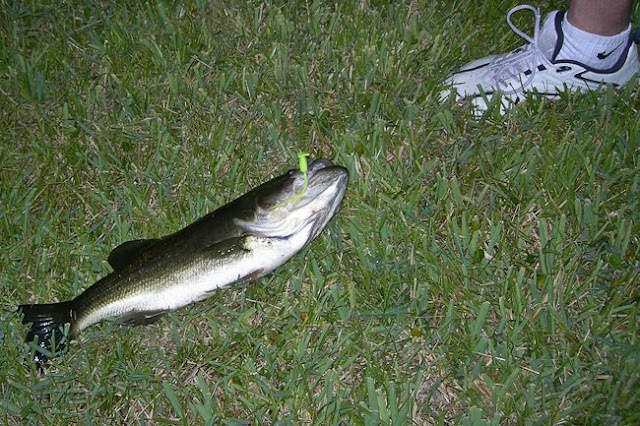 I broke off two fish, one on a green deer-hair mouse and one one a popper. The mouse stopped floating, so I just twitched it along underwater. It just stopped, and when I pulled back on the rod, it didn't move at all, and then just broke off at the knot. It could have been a gator or a turtle, since it didn't behave like a bass. I then lost the popper during the ensuing fight, again at the knot. I then cut the leader back a bit, and didn't lose any more fish. I had to cut off a foam-bodied popper (gurgle bug? ), since it just wouldn't come out of the fish's jaw. My last fly was another popper, which I still have. "Most of the fish were pretty big, at least for me. Karen took all of the photos. 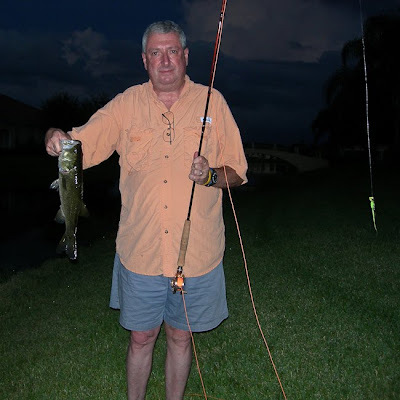 I think I'll take a heavier rod with me next time (Nov.), since the rod I had didn't have enough backbone to lift the fish out of the water, and I was reluctant to stick my hand down into the water next to the bank to pick them up." "All of the flies I used worked. (You have to love how aggressive largemouths are.) The fly I plan to tie and take in Nov. is very similar to the Gurgle Pop I saw on your blog. The body is sparkly chenille, the tail is bucktail, and the body is foam tied in the length of the hook with a "hood" in front to create the commotion when retrieved. If you look at the pictures closely, you'll see a chartreuse one in the jaws of a couple of fish. Unfortunately, it was stuck too deep in one fish for me to get it out, so I cut it off and threw the fish back into the water."